Among the various materials that make up marine debris, lumps of petroleum waxes such as paraffin and microcrystalline wax, are regularly found on beaches worldwide, although not included in the current definition of marine litter. Ingestion by marine organisms is occasionally documented in the scientific literature and mass beaching events are frequently reported along the European coasts, with obvious detrimental consequences to the local communities that have to manage the clean-up and disposal of this substance. According to Annex II of the MARPOL regulation, petroleum waxes are classified as “high viscosity, solidifying, and persistent floating products,” whose discharge at sea of tank-washing residues is strictly regulated, but currently permitted within certain limits. Starting from the description of a large stranding event occurred along the Italian coasts in 2017, we review the existing knowledge and regulatory framework and urge the relevant authorities to address this issue, showing that wax pollution is creating evident damages to the European coastal municipalities. Pending further investigations on the potential hazard that this kind of pollution is posing to marine ecosystems, we suggest a careful and more stringent revision of the policies regulating discharges of these products at sea. The global production of industrial waxes currently amounts to 4.79 million tons, with a market size valued at 6.7 billion USD and an expected annual growth of 1.5–2%, driven mainly by increasing demand for single-use packaging applications (Wei, 2012; Grand View Research, Inc., 2017). The market is mainly segmented into bio-based, synthetic, and fossil-based waxes. Fossil-based waxes comprise mineral waxes (such as montan wax derived from coal and ozokerite) and petroleum waxes (petrolatum, paraffin, and microcrystalline waxes), also known as hydrocarbon waxes. Other types of industrial wax include synthetic waxes produced by a series of chemical reactions (e.g., through the Fischer-Tropsch process, or using alpha-olefin and polyethylene waxes), waxes of animal origin (e.g., beeswax, chinese wax, tallow, lanolin) and vegetable waxes, such as candelilla, carnauba, castor, and soy wax (Bennett, 1963; Casadei et al., 2010). Petroleum waxes are by far the most important in terms of volume produced and economic impact, accounting for 85–90% of the global wax consumption, although demand for synthetic and vegetable waxes has been growing steadily in recent years (Kline & Company, Inc., 2010). Petroleum waxes are crude oil derivatives primarily consisting of a mixture of hydrocarbons with typical melting points comprised between 35 and 95°C (Buchler and Graves, 1927; Mansoori et al., 2004). They appear as creamy white to dark yellow or pale brown water-insoluble substances, generally solid at room temperature but highly viscous at moderate temperatures (Moore & Munger Marketing Inc., 1995). Most producers offer three distinct types of petroleum waxes: paraffin waxes, which are characterized by large, well formed crystals; microcrystalline waxes (also known as microwax), which have higher melting points and smaller irregular crystals and petrolatum, also known as petroleum jelly or jelly wax (Warth, 1956; Petersson et al., 2008). Paraffin waxes are typically obtained as a by-product during the production of lubricating oils and mainly consist of saturated long-chain hydrocarbons, ranging from C18 to C60, and predominantly greater than C25 (Cottom, 2000). Microcrystalline waxes instead, are produced by de-oiling petrolatum, as part of the petroleum refining process and contain a much higher percentage of branched and naphthenic hydrocarbons, in addition to normal alkanes (Srivastava et al., 1993; Mansoori et al., 2004). They have a higher molecular weight and are generally darker, more viscous, denser, tackier and more elastic than pure paraffins (Cottom, 2000). Most of the petroleum waxes sold commercially however, are a mixture of “normal” (straight chained) and “iso” (or branched) alkanes with varying levels of purity. Fully refined waxes have oil contents < 0.5–0.75%. Semi-refined waxes have up to 1.5–3% oil, while scale and slack waxes have even more oil, up to a common maximum of 35–40% (Freund et al., 1983; Kumar et al., 2007). These waxes are thermoplastic materials but, due to their relatively low molecular weight, they are normally not considered to be plastics or polymers. Depending on the formulation, on the crude-oil source and on the method and degree of refinement, petroleum waxes can range from being soft enough to be molded by hand to being brittle and hard enough to be carved with rotary tools (Dwivedi et al., 2017). Their high versatility and low reactivity makes them suitable for a myriad of industrial applications. Candles production is by far the most important segment, currently accounting for around 40–50% of the global market revenue (Wei, 2012; Kline & Company, Inc., 2010). Other important applications include coatings for wood, paper, packaging and food products, cosmetics, chewing-gums, crayons, home-care products, pharmaceuticals, polishes, hot-melt adhesives, surf and ski waxes, electrical insulators and tires, plastic and rubber additives—such as plasticizers, binders, flame retardants, and rheology modifiers (Nasser, 1999; Mansoori et al., 2004; Kumar et al., 2005). Each year, large volumes of fully refined or unrefined (slack) petroleum wax are transported in bulk by tankers and cargo ships around the world (Wei, 2012). To be loaded or discharged in liquid form, certain products must be kept at temperatures above their melting point and to do so, vessels are often equipped with cargo heating coils. After unloading, certain amounts of product will typically remain on the bottom of the cargo tanks or crystallize against the bulkheads and interior equipments, forming the so-called “stripping” residuals. Unrefined crude oils, also contain substantial amounts of paraffin waxes, which being highly viscous, tend to crystallize and adhere to pumps, piping, and tank walls during loading and unloading operations—a phenomenon known as “clingage”, causing every year losses of billions of dollars to the petroleum industry (Sanjay et al., 1995; Mansoori et al., 2004). The amount of these residuals is generally in the order of a few hundred liters per tank and is mainly related to the age and design of the ship, as well as to the efficiency of the stripping system and to the position of the suction intakes. Tanks are usually cleaned manually by the crew or automatically by rotary-jet cleaning systems using steam, hot water or chemical solvents (Sea-Mer Asso, 2017). The residuals can then be treated by port reception facilities, or be discharged at sea under certain conditions. Operational practices are regulated by the Annex II of the International Convention for the Prevention of Pollution from Ships (MARPOL 73/78) issued by the International Maritime Organization (IMO), which contains regulations for the control of pollution by Noxious Liquid Substances (NLS) transported in bulk, defining the standards and principles which must be adopted to discharge harmful substances at sea, as well the standards for controlling such releases. According to the latest version of Annex II, entered into force in 2007, petroleum waxes are classified as “high viscosity and solidifying substances” that fall within the intermediate pollution category Y: “Noxious Liquid Substances which, if discharged into the sea from tank cleaning or deballasting operations, are deemed to present a hazard to either marine resources or human health or cause harm to amenities or other legitimate uses of the sea and therefore justify a limitation on the quality and quantity of the discharge into the marine environment.” The other two pollution categories are Category X (NLS presenting a major hazard to the marine environment whose discharge at sea is completely prohibited) and Category Z (NLS presenting a minor hazard to the marine environment therefore justifying less stringent discharge regulations). When unloading category Y high-viscosity or solidifying substances (i.e., with a viscosity equal to or greater than 50 mPa·s at 20°C and/or a melting point greater than or equal to 0°C), MARPOL Annex II provides that the ship tanks should be emptied (stripped) to the maximum extent possible, a tank prewash procedure shall then be applied and the residue/water mixture generated during the prewash shall be discharged to a reception facility at the port of unloading—or to another port provided that it has been confirmed in writing that an adequate facility is available—without the need of achieving any final concentration in the effluents, unlike what happens for category X substances (Regulation 13, Paragraph 7.1.3). Therefore, within the so called “stripping limits”—i.e., between 75 and 300 liters + 50 liters tolerance, depending on the ship's age and category—remaining cargo residues can be legally discharged at sea, provided that the discharge is made below the waterline, en route at a minimum speed of 7 knots and at least 12 nautical miles from the nearest land and in water depths exceeding 25 m. The only exception to this is the Antarctic region where any discharge of NLS or mixtures containing such substances is prohibited. No other region is listed as special area for discharge restrictions under the provisions of Annex II, therefore in particularly sensitive regions such as the Mediterranean Sea, the Arctic Ocean, the North and the Baltic Seas, there is no general ban on the discharge of waxy residuals, contrary to what is foreseen for plastic waste and ship's garbage for instance, under MARPOL Annex V.
Currently, there are no reliable estimates on the amount of petroleum waxes being discharged at sea every year. Big pollution events were already reported in the early 1990s along the coasts of Netherlands, Denmark, and Germany (Dahlmann et al., 1994). In some cases, up to 8 tons of paraffin wax were released by a single tank-washing and stranded on a German beach in 1992, while in 1993 a single pollution event was estimated to have killed more than 2,000 birds in the northern part of the Netherlands, although it is not clear if the killing was caused by paraffin wax or palm oil (Dahlmann et al., 1994). During the same year, Scholten (1993) reported that between 10,000 and 20,000 seabirds (mainly guillemots and, to a lesser extent auks and kittiwakes) stranded in the North Sea due to impairment of the bird's feathers protective layer caused by pollution with a refined liquid paraffin, mainly composed of C14–C20 alkanes. As reported in UEG (2014), “complex pollution incidents” are defined as large spills involving at least 30 m3 of material or alternatively, impacting at least 10 km of coastline. Poorly reported in the scientific literature, these large beaching events are frequently disclosed by local and national newspapers across Europe. A web search revealed for instance that in recent years large strandings of yellow or white waxy materials, often but not always confirmed as petroleum wax, occurred in the Baltic Sea (May 2010), North Yorkshire (May 2017), Northern France (several events in 2016 and two events in July and October 2017), Suffolk and Norfolk (May 2011), Netherlands (Multiple events in 2007, 2015, 2016, and 2017), Italy (2012, 2014, October 2016 and June and November 2017), Denmark (March, June, and August 2017) and 7 more accidents occurred in Germany between 2007 and 2014 according to UEG (2014), with most of these records being in the order of few tonnes of beached wax stranded along tens or hundreds of kilometers of coastline. According to a report released from KIMO (2017), at least 91 incidents occurred between 2012 and 2016 in 5 Northern European countries (Denmark, Germany, The Netherlands, Sweden, and France), costing well over 1.4 million euros to clean up. The German Federal Maritime and Hydrographic Agency (BSH) also reported that paraffin pieces were found in 24 of 33 trawl nets performed in the North Sea, but that no estimates were available about the total amount of paraffin wax currently floating in the North Sea. The only other certain record pertaining to off-shore waters came in 2013, when several fragments of a white paraffinic wax were found in a sample collected in the Southern Adriatic Sea during a survey for floating microplastics (Suaria et al., 2016). Lumps and pieces of wax are also commonly found during beach litter surveys, despite chemical identification of these materials is rarely provided by the authors. The first record dates back to the 1960's on a Southern Californian beach (Ludwig and Carter, 1961). Since then, the occurrence of wax has been reported from beaches in Panama (Garrity and Levings, 1993), South Korea (Jang et al., 2014), Brazil (Leite et al., 2014), Spain (Williams et al., 2016), Italy (Peirano, A., pers. comm. pertaining to 2017), Portugal (Zhukov, 2017), Bulgaria (Simeonova et al., 2017), South Africa (Lamprecht, 2013), Germany (Liebezeit, 2008), Hawaii (Moore C. J., pers. comm. pertaining to 2006), Russia (Chubarenko et al., 2018), and even from the shores of remote islands such as the Pitcairn archipelago (Benton, 1995), the sub-antarctic Macquarie Island (Slip and Burton, 1989), and Tristan da Cunha, the most remote inhabited island of the world (Ryan, 1987). Three groups of “Paraffin or wax pieces” (100_108 to 100_111 according to their size) are also included in the OSPAR Beach Litter Monitoring Program under the category “other pollutants” (OSPAR Commission, 2010), even if these items were later omitted from statistical analysis (Schulz et al., 2015, 2017), as “not always easily and consistently identified, and generally not considered as “litter” or “debris” but as chemical pollution” (van Franeker, 2013). Data extracted from the OSPAR Beach Litter Database (freely retrieved from https://www.mcsuk.org/ospar/), show that between 2001 and 2016, paraffin or wax pieces (visually identified as such) were found in 371 out of 2,824 litter surveys performed on 151 different beaches, with a mean estimated abundance—when the wax was present—of 14.6 items per meter of strandline (max 738 items/m). The vast majority of these items were found in the North Sea region, with most records coming from Denmark, Sweden, France, Germany, Belgium, and the Netherlands. Also, a sharp increasing trend seemed to occur during the 16 years survey. Just 8.9% of all the wax observations were related to the first 10 years of monitoring (2001–2010), while over 91% of the wax was found in the last 6 years period (2011–2016), with mean abundances (± standard error) going from 0.41 ± 0.10 items/m (n = 1,159 surveys; max: 80 items/m) to 2.96 ± 0.64 (n = 1,665 surveys; max: 738 items/m), respectively. Wax lumps were found also in the Arctic (including Iceland and Greenland) with a maximum abundance of 9 items/m reported from a Norwegian beach in the Tromsø Region. On a global scale, wax is generally outnumbered by the more abundant plastic items, but it can occasionally dominate the composition of beach litter. For instance, on 4 Lithuanian beaches sampled 10 times between 2014 and 2016, paraffin wax (visually determined as such) was reported to be the main polluter, accounting for 63% of all litter items, with values peaking to 70% of the total and to 94% of the micro-litter fraction <5 mm (Haseler et al., 2018). Similarly in the Russian Baltic, Esiukova (2017) showed that maximum contents of (visually distinguished) paraffin wax in sand samples can range from 0.03 to 8.66% of dry mass. Her analysis also showed that wax aggregates can concentrate microplastic items, and that inside wax lumps there are on average 31.1 ± 18.8 microplastics per sample or 11,479 ± 10,785 items per kg of wax. As pointed out by the author, these quantities are three orders of magnitude larger than those found in the surrounding beach sediments, indicating that lightweight sticky waxes (especially crooked pieces) collected from the beach wrack lines, can act as effective accumulators of various types of contamination, including microplastics (Esiukova, 2017). Surprisingly, although China and U.S. are the world leaders in wax production and consumption (Wei, 2012), we could not find any records of wax strandings in these two countries. It should be noted however, that during beach litter surveys—with the notable exception of the OSPAR region—wax residues are often placed in the categories “others” or “miscellaneous,” as also recommended by UNEP/IOC monitoring guidelines for beach litter (Cheshire et al., 2009). For this reason, their presence is almost never explicitly mentioned in the scientific literature and their real occurrence on worldwide beaches is largely unknown. In laboratory conditions, various degrees of biodegradability of long-chain n- and iso-alkanes, paraffin wax and polyethylene waxes have been demonstrated by various strains of bacteria and fungi (e.g., Hanstveit, 1992; Marino, 1998; Rahman et al., 2003; Kawai et al., 2004; Sood and Lal, 2008; Zahed et al., 2010; M'rassi et al., 2015; Zhang et al., 2016). No information however is currently available on the actual residence time of these substances at sea, as field studies on their actual biodegradation rates in the marine environment have never been performed. Early observations from paraffin-rich wax inclusions in beached oil—likely derived from crude oils deposits during tank cleaning operations—suggested that the half life of this waxy precipitates must be measured in terms of years, and that only few signs of degradation occur after 16 months of exposure in the marine environment (Blumer et al., 1973). Regardless, once at sea or on the shoreline these substances can interact with marine fauna, with most of the studies concerning ingestion by seabirds. Lumps of wax and paraffin-like materials have been reported in the stomach content of northern fulmars (Fulmarus glacialis) from the North Sea (van Franeker et al., 2011) and from the Labrador Sea (Avery-Gomm et al., 2017), as well as in regurgitates from Black Legged Kittiwakes (Rissa tridactyla) and Great Cormorants (Phalacrocorax carbo) in Ireland (Acampora et al., 2017). Interestingly, a statistically significant increase in the ingestion of wax by Northern fulmars was found to occur from 1982 to the year 2000 in the North Sea, with paraffin-like substances being also the major category in terms of incidence and weight in ingested litter (28% incidence and mean mass of 0.54 ± 3.53 g and 2.2 ± 6.6 items per bird) (van Franeker and Meijboom, 2002). The authors in this case suggested that changes in the occurrence of a substance in the bird's stomachs would be proportional to a change in its abundance at sea. The only other available record of wax ingestion by marine organisms pertains to 2015, when a piece of wax was found in the gastroinstestinal tract of a post-hatchling loggerhead turtle (Caretta caretta) stranded lifeless on a South African beach (Ryan et al., 2016). However, as most of the studies are lacking chemical identification of the ingested material, realistic levels of exposure for marine populations are currently unknown. As already reported by UEG (2014) and EFSA (2013), it is not possible to make a general statement regarding the health risks of petroleum waxes. Since they are widely used in food, packaging, cosmetics, and pharmaceutical products, their safe use for human consumption has been historically supported by a number of chronic and sub-chronic feeding studies in mice, rats, and rabbits, showing that no health hazard is present if the wax meets certain purity requirements (Shubik et al., 1962; Elder, 1984; Ekelman, 1993; EFSA, 2013), event though in later studies, some inflammatory responses and histopathological reactions were observed in certain strains of laboratory rats fed with relatively high doses of paraffin waxes (Smith et al., 1996; Griffis et al., 2010). Whereas, refined paraffins (<0.75% oil content) are generally deemed as not dangerous as they are not known to have hazardous or irritating properties, most industrial waxes have a lower level of purity and their polyaromatic hydrocarbon (PAH) content—mainly originating from the paraffin extraction process—can cause irritation to the skin and eyes (Shubik et al., 1962; Lijinsky et al., 1963; Ekelman, 1993; UEG, 2014). As a matter of fact, varying concentrations of different PAHs have been measured in petrolatum (Lijinsky et al., 1963), microcrystalline wax (Mazee et al., 1966; EFSA, 2013), paraffin wax (Mazee et al., 1966; Lau et al., 1997), and in an industrial wax washed ashore in Germany in 2012, in which case a PAHs content of 18 mg/kg was measured, far exceeding safe exposure levels for children (UEG, 2014). In addition, many of these PAHs, some cleaning agents used in the shipping industry such as perchlorethylene or trichlorethylene, as well as petrolatum and montan wax are all classified as carcinogenic by the European Union (UEG, 2014; Sea-Mer Asso, 2017). Few information however exist about the health risk posed by exposure to unrefined waxes and the ecological impacts in marine ecosystems are currently unknown, as to the best of our knowledge a rigorous environmental impact assessment has never been performed. This work originates from a large-scale stranding event that took place in the Ligurian Sea (Northern Thyrrenian) between 16 and 19 of June 2017. In this occasion, more than 350 kg of yellow wax lumps were recovered by a special boat after that an aerial survey initially identified several patches of this floating substance along a 5 miles front across the northern side of Elba Island in Italy. As much as double the quantity were later recovered along a 200 km stretch of coast in Tuscany, with mean densities peaking along the water's edge to 15 kg/m2 and 16,400 fragments/m2, mainly comprised between 5 and 30 mm in diameter (with the most abundant being <10 mm) (Figure 1). 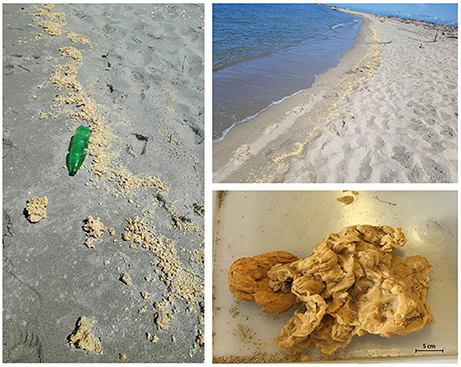 In those same days, beaching of the same yellow material were reported from neighboring regions such as Liguria and Corsica (Figure 2), demonstrating the rapid dispersion of this substance through wind drift and surface currents. Cleaning was largely paid and organized by the local authorities and private beach owners, as the event occurred during high touristic season. In the same area, a previous beaching event occurred in 2012, when two metric tons of a white paraffinic wax were scooped by draining pumps. In that case, the investigations carried out by the competent authorities ascertained that the material had been discharged from a ship during tank-cleaning operations. Local authorities subsequently reported that the clean-up intervention costed around 20,000 euros to the involved municipalities, highlighting how such events imply considerable economic costs to local businesses and tax-payers which are not indemnified by the polluters and improperly burden the local communities. Figure 1. Pictures of the yellow wax lumps found on the Beach in Migliarino-San Rossore National Park (Tuscany, Italy) in June 2017, later revealed to be a microcrystalline wax. The top-right panel shows the extent of the beaching event which likewise involved hundreds of kilometers of coastline. Figure 2. Map showing the location of the pollution event occurred in the Ligurian Sea between 16 and 19 of June 2017. The yellow stars indicate the locations where the wax was initially found and collected, while the red lines indicate the portions of the coastline affected by the spill. We collected and characterized the beached substance through FT-IR analysis (Fourier-Transform Infrared Spectroscopy), which identified the material as microcrystalline wax (CAS Registry Number: 63231-60-7) with a hit quality with reference spectra of 80.6% (Figure 3). Further gas-chromatographic determinations made by ARPAT laboratories in Livorno (Regional Agency for the Environmental Protection of Tuscany), classified the substance as a paraffinic or polyethylenic wax and excluded acute toxicity and the presence of volatile organic compounds and inorganic contaminants (heavy metals); such as to exclude its classification as hazardous waste. It was then concluded that the stranded material should be ascribed to urban waste and disposed of accordingly. Cleaning however, was carried out using mechanical equipment such as sieving machines and agricultural harrows, or by hand using wide meshed nets, largely resulting in the burial and displacement of many residuals and leading to a further fragmentation of the material, which is likely to represent an increased availability for local fauna and avifauna. 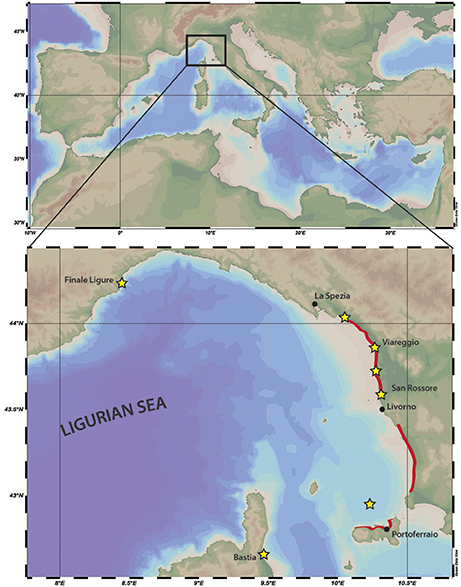 A monitoring activity, part of a larger annual sampling program, involving several beaches in marine protected areas of the italian coast (Merlino et al., 2015), revealed that in September, three months after cleaning of the beach from local authorities, values up to 4,740 items/m2 were still found in Viareggio beach, with several fragments observed also in the back-shore as well as in the dune areas. Figure 3. 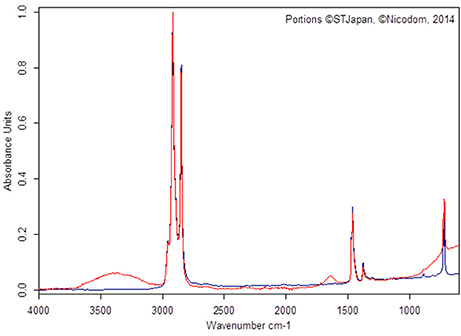 FT-IR spectra of the material collected on the beach in Pisa-San Rossore (in red). Comparison with reference spectra (in blue) confirmed the material as a microcrystalline wax (CAS No. 63231-60-7) with a hit-quality of 80.6%. The analysis was performed on 26/10/2017 with a LUMOS FT-IR Microscope (Bruker Optics Inc.) and processed with OPUS software. It is worth noting that this accident occurred in the hearth of the Pelagos Sanctuary for Mediterranean Marine Mammals, which is an important feeding ground for baleen whales and the only international high-seas protected area in the world (Notarbartolo-di Sciara et al., 2008). Additionally, large amounts of wax stranded along a portion of coastline comprised within the “Migliarino, San Rossore, Massaciuccoli Natural Park,” designated by UNESCO as Biosphere Reserve and in close proximity to the Marine Protected Area of “Secche della Meloria.” Being a protected area, this beach is not subject to normal cleaning operations and the wax here has never been removed. During a visit carried out in November 2017, 5 months after the beaching event, substantial quantities of wax were still found on this beach. The fragments in this case were more rounded, suggesting a levigating effect of the sea and waves on the shape of the particles. There is ongoing discussion at the International Maritime Organization (IMO) to strengthen discharge rules for certain liquid chemicals in particular high-viscosity and persistent floating products, like petroleum waxes, and vegetable oils. In 2004 “paraffins and hydrocarbon waxes” were reclassified by the GESAMP Working Group on the Evaluation of the Hazards of Harmful Substances carried by ships (EHS 40/9), but their hazard category remained substantially unchanged. More recently, proposals for amendments to MARPOL Annex II have been made to the IMO Marine Environment Protection Committee in May 2015 (MEPC 68). The Committee agreed to include in the agenda of the Pollution Prevention and Response Sub-Committee (PPR) the “Review of MARPOL Annex II and the IBC code requirements (International Code for the Construction and Equipment of Ships carrying Dangerous Chemicals in Bulk), that have an impact on cargo residues and tank washings of high viscosity, solidifying and persistent floating products and associated definitions and preparation of amendments.” Discussions included the revision of the definition of high-viscosity cargoes to widen its application, increased tank pre-washing and the use of shore reception facilities. • n-Alkanes (liquid paraffins C10−C20, containing predominantly n-alkanes with up to 5% iso- and cyclo- alkanes and some aromatics below 2%, but with no carcinogenic aromatic compounds). • Paraffin wax, highly-refined (pharmaceutical or food grade paraffins consisting of n-, iso-, and cyclo- alkanes, up to 0.5% mineral oil and PAHs below 0.1%). • Paraffin wax, semi-refined (technical quality paraffins consisting of n-, iso-, and cyclo- alkanes with up to 15% aromatic hydrocarbons, up to 5% mineral oil and up to 1% PAHs with <0.1% carcinogens such as benzene). • Hydrocarbon wax (crude material from the refinery consisting of n-, iso-, and cyclo- alkanes with up to 15% aromatic hydrocarbons and PAHs above 0.1%, i.e., slack wax or petrolatum). • The North West European waters (including the North Sea, the Irish Sea, the Celtic Sea, the English Channel, and part of the North East Atlantic). • Norwegian waters north of 62°. Lastly, ESPH suggested that Annex II could be amended to clarify that the use of small amounts of cleaning additives (not containing pollution category X components) would improve and maximize the removal of high-viscosity cargo residues during prewash operations. These amendments were submitted to the fifth session of the PPR Sub-Committee (PPR 5) which was held in February 2018 and will be further discussed during MEPC 72 in April 2018. • Wax pollution is global in scope and is certainly not restricted to Northern European countries. If a geographical approach is to be adopted, the sea areas in which the new prewash requirements would apply should be extended to include other sensitive areas such as the Mediterranean Sea, where at least three large strandings occurred in recent years. Nevertheless, once recognized the danger posed by these persistent floaters, a product-based approach would be undoubtedly more appropriate. • In light of the GESAMP hazard profiles, which take into account bioaccumulation in marine organisms; damage to marine life and habitats; hazard to human health and reduction of amenities such as beach uses and tourist activities (Wells et al., 1999), it would be advisable to reclassify all different kinds of petroleum waxes (including highly refined and liquid paraffins) in the pollution category X, i.e., substances whose discharge at sea is completely prohibited and for which a residual concentration of 0.1% should be met in the prewash effluents—inasmuch as they all possess the same physico-chemical characteristics and pose the same potential risk to the marine environment of slack waxes, semi-refined paraffins and petrolatums, regardless of their aromatic hydrocarbon, and PAHs content. • Despite the revision of the names for paraffin entries in the GESAMP/EHS Composite List, there is still a great blur on the terminology used. The updated list of paraffin-like products, does not currently mention the term “petroleum waxes,” which encompasses many other commonly traded products such as “microcrystalline waxes.” The term “hydrocarbon wax” is considered as a synonym for petrolatum or slack wax, while in other contexts it is mainly used as synonym for the more general “petroleum waxes” (see the Introduction section and references therein). This great blur is also reflected in the updated list of carriage requirements, under which the new paraffin-like categories all share the same synonyms. The adoption of a univocal vocabulary and the creation of a less ambiguous classification system are an urgent necessity. • As reported by Sea-Mer Asso (2017), the amount of beached material often exceeds the limits set by Annex II for stripping residuals, as it was the case for the event occurred along the Italian coasts in 2017. Hence, these episodes almost certainly represent examples of MARPOL violations, which would not be resolved regardless of the proposed amendments. Greater attention perhaps, should be directed by national governments toward the enhancement of adequate port reception facilities, surveillance bodies, and policy enforcement mechanisms. • According to MARPOL Annex V, shipboard generated garbage, including plastics, domestic wastes, cooking oil, incinerator ashes, operational wastes, and fishing gear are prohibited to be discharged at sea, under no circumstances, inside as well as outside special areas. Given that once in the marine environment, solidifying substances and persistent floaters behaves and possesses the same risk characteristics of plastic waste (i.e., long residence times, potential for ingestion by marine organisms, aesthetically detrimental, progressive fragmentation, etc. ), it seems inconsistent that dumping of wax cargo residues is still permitted, while dumping of any other kind of solid waste is already prohibited. In light of this, the inclusion of solidifying products and persistent floaters under the provisions of MARPOL Annex V could be ultimately taken into consideration by the IMO. • It should be noted that within the EU Marine Strategy Framework Directive (MSFD 2008/56/EC) and especially in light of the achievement of Good Environmental Status (GES) of European waters by 2020, pollution by paraffin and other petroleum waxes is not exhaustively codified. The category “paraffin/wax” is included in the master list of litter categories within GES Descriptor 10 (TSG_ML code G213; Hanke et al., 2013). However, as already highlighted by Galgani et al. (2010), the current definition of marine litter, described as “Any persistent, manufactured, or processed solid material discarded, disposed of or abandoned in the marine and coastal environment,” does not include semi-solid remains of mineral and vegetable oils, waxes, and chemicals. In addition, although the establishment of a “minimum list of elements and/or parameters for assessing GES for acute pollution events: number and extent of petroleum/oil related (hydrocarbons) and analogous oil compounds (paraffin, vegetable oils) slicks” was recommended by Tornero (2015), petroleum waxes are not explicitly mentioned in GES Descriptor 8.1.2 (Acute pollution events) and associated criteria (e.g. D8C3: “The spatial extent and duration of significant acute pollution events are minimized”), nor they are included in the MSFD list of “Potential chemical contaminants in the marine environment” (Tornero and Hanke, 2016, 2017). Therefore, we suggest to make explicit reference to paraffin and other petroleum waxes in Descriptor 8 and—as policy against marine litter is already coming in place—we recommend to expand the current definition of marine litter, as to include solidifying and persistent floaters within the framework of Descriptor 10, so that the objectives set by recent and future policy actions—such as the monitoring and reduction targets set by the MSFD—will also embrace this particular category of contaminants. Pollution events by paraffins and other petroleum waxes are posing a significant problem to local municipalities across Europe with new incidents being reported on a regular basis. Clean-up costs often fall on the local governments and the severity of the problem becomes even more apparent when taking into account the frequent occurrence of these materials at sea. In most cases, these episodes originates from the inadequacy of the current legislative framework, with this contravening the spirit of the MARPOL provisions on the protection of the marine environment. The new version of Annex II which is currently being drafted, will surely improve the situation. But as long as the discharge at sea of these residuals will be a legal practice, the clean-up costs will keep burdening the local communities and there will be no legal tools to ensure fair compensation by the polluters. As strongly highlighted by the IMO Marine Environment Protection Committee (MEPC) in their “Action Plan to tackle the alleged inadequacy of port reception facilities” and in the following EU Directive on port reception facilities (2000/59/EC), one of the main limiting factors is the inadequacy of most reception facilities and the cost for ship's owners to properly dispose of tank washings. We therefore call on national governments to provide adequate shore infrastructures, so that the MARPOL regulations can be successfully implemented. Ultimately, a more effective protection of the marine environment could be eventually achieved—in line with the adoption of the precautionary principle—through the enforcement of more stringent regulations by individual governments, federal or supranational bodies, in order to ensure suitable protection of their territorial waters and those of neighboring regions. SM and MA: provided early notice of the beaching event, collected samples of the spilled substance, and performed repeated monitoring of the impacted sites; GS: performed the literature search and wrote the first draft of this manuscript; SA: revised the text. All authors accepted it in its final version. Thanks are expressed to Dr. Diego Sali (Bruker co.) for help with FT-IR analysis and to the two referees for valuable comments on the first draft of this manuscript. We are thankful also to the OSPAR commission and to all persons involved in the collection of OSPAR beach litter data. Bennett, H. (1963). Industrial Waxes, Vol. 1, Natural and Synthetic Waxes. Brooklyn, NY: Chemical Publishing Company. Benton, T. (1995). From castaways to throwaways: marine litter in the Pitcairn Islands. Biol. J. Linn. Soc. 56, 415–422. Blumer, M., Ehrhardt, M., and Jones, J. (1973). The environmental fate of stranded crude oil. Deep Sea Res. Oceanogr. Abstr. 20, 239–259. Buchler, C., and Graves, G. (1927). The petroleum waxes. Indus. Eng. Chem. 19, 718–724. Casadei, E., Chikamai, B., and Singh, B. (2010). “Gums, resins and waxes,” in Industrial Crops and Uses, ed B. P. Singh (Fort Valley, GA: CABI), 411. Cheshire, A. C., Adler, E., Barbiére, J., Evans, S., Jarayabhand, S., et al. (2009). UNEP/IOC Guidelines on Survey and Monitoring of Marine Litter. UNEP Regional Seas Reports and Studies, No. 186; IOC Technical Series No. 83:xii+120. Dahlmann, G., Timm, D., Averbeck, C., Camphuysen, C., Skov, H., and Durinck, J. (1994). Oiled seabirds – comparative investigations on oiled seabirds and oiled beaches in the Netherlands, Denmark and Germany (1990–1993). Mar. Pollut. Bull. 28, 305–310. Dwivedi, A. P., Ghosal, G., and Belkhode, P. (2017). Studies in properties of microcrystalline and paraffin waxes with the help of Gas Chromatography (GC), DSC, FT-IR and by conventional methods. Int. J. Sci. Res. Sci. Technol. 3, 922–929. Ekelman, K. (1993). “Microcrystalline wax and paraffin wax,” in Toxicological Evaluation of Certain Food Additives and Naturally Occuring Toxicants, Vol. 30, ed W. F. A. Series (Geneva: World Health Organization/International Programme on Chemical Safety), 253–260. Elder, R. (1984). Final report on the safety assessment of fossil and synthetic waxes. J. Am. Coll. Toxicol. 3, 43–99. Freund, M., Csikós, R., Keszthelyi, S., and Mózes, G. (1983). “Paraffin products: properties, technologies, applications,” in Developments in Petroleum Science, Vol. 14, ed G. Mózes (New York, NY: Elsevier Scientific Pub. Co.), 335. Galgani, F., Fleet, D., van Franeker, J., Katsanevakis, S., Maes, T., Mouat, J., et al. (2010). Marine Strategy Framework Directive - Task Group 10 Report on the Identification of Descriptors for the Good Environmental Status of European Seas regarding marine litter. Office for Official Publications of the European Communities. Garrity, S. D., and Levings, S. C. (1993). Marine debris along the Caribbean coast of Panama. Mar. Pollut. Bull. 26, 317–324. Grand View Research, Inc. (2017). Paraffin Wax Market Analysis By Application (Candles, Packaging, Cosmetics, Hotmelts, Board Sizing, Rubber), By Region (North America, Europe, Asia Pacific, Central & South America, Middle East & Africa), By Country, And Segment Forecasts, 2014 - 2025. Technical Report, Report ID: 978-1-68038-520-5, Grand View Research, Inc.
Hanke, G., Galgani, F., Werner, S., Oosterbaan, L., Nilsson, P., Fleet, D., et al. (2013). Guidance on Monitoring of Marine Litter in European Seas. MSFD GES Technical Subgroup on Marine Litter (TSG-ML), Publications Office of the European Union, EUR 26113 EN. Hanstveit, A. O. (1992). Biodegradability of petroleum waxes and beeswax in an adapted CO2 evolution test. Chemosphere 25, 605–620. KIMO (2017). International Annual Report 2017. Technical Report,KIMO(Kommunenes Internasjonale Miljøorganisasjon, Shetland). Kline & Company, Inc. (2010). Global Wax Industry 2010: Market Analysis and Opportunities. Technical Report Y635A, Kline & Company, inc.
Lamprecht, A. (2013). The Abundance, Distribution and Accumulation of Plastic Debris in Table Bay, Cape Town, South Africa. Ph.D. thesis, University of Cape Town. Lau, C., Fiedler, H., Hutzinger, O., Schwind, K.-H., and Hosseinpour, J. (1997). Levels of selected organic compounds in materials for candle production and human exposure to candle emissions. Chemosphere 34, 1623–1630. Lijinsky, W., Domsky, I., Mason, G., Ramahi, H., and Safavi, T. (1963). The chromatographic determination of trace amounts of polynuclear hydrocarbons in petrolatum, mineral oil, and coal tar. Analyt. Chem. 35, 952–956. Ludwig, H. F., and Carter, R. (1961). Analytical characteristics of oil-tar materials on southern california beaches. J. Water Pollut. Control Fed. 33, 1123–1139. Mansoori, G. A., Barnes, H. L., and Webster, G. M. (2004). “Chapter 19: Petroleum waxes,” in Fuels and Lubricants Handbook: Technology, Properties, Performance, Testing, ed G. E. Totten (West Conshohocken: ASTM International), 525–556. Marino, F. (1998). Biodegradation of Paraffin Wax. Ph.D. thesis, McGill University. Mazee, W., Gersmann, H., and Van Der Wiel, A. (1966). Analysis of polycyclic aromatic hydrocarbons in petroleum waxes and white mineral oils with appraisal of merits of different methods of analysis. Food Cosmet. Toxicol. 4, 17IN125–24IN233. Moore & Munger Marketing Inc. (1995). Waxes used in hot-melt adhesives. Case A. J. Adhes. Sealant Council XXVI, 125–150. Nasser, W. (1999). “Waxes, natural and synthetic,” in Encyclopedia of Chemical Processing and Design Vol. 67, ed J. J. McKetta (New York, NY: Marcel Dekker Inc.), 500. OSPAR Commission (2010). Guideline for Monitoring Marine Litter on the Beaches in the OSPAR Maritime Area. Technical Report, OSPAR Commission, London. Ryan, P. G. (1987). The origin and fate of artefacts stranded on islands in the African sector of the Southern Ocean. Environ. Conserv. 14, 341–346. Sanjay, M., Simanta, B., and Kulwant, S. (1995). Paraffin problems in crude oil production and transportation: a review. SPE Prod. Facilit. 10, 50–54. Scholten, M. (1993). Guillemot stranding caused by a paraffin oil spillage. Mar. Pollut. Bull. 26:173. Sea-Mer Asso (2017). Industrial Paraffin-Wax Strandings on the Eastern Coast of the Channel. Contexts and Stakes. Technical Report, Sea-Mer Asso. Shubik, P., Saffiotti, U., Lijinsky, W., Pietra, G., Rappaport, H., Toth, B., et al. (1962). Studies on the toxicity of petroleum waxes. Toxicol. Appl. Pharmacol. 4, 1–62. Slip, D. J., and Burton, H. R. (1989). “The composition and origin of marine debris stranded on the shores of subantarctic Macquarie Island,” in Proceedings of the Second International Conference on Marine Debris, 2–7 April 1989, eds R. Shomura and M. L. Godfrey (Honolulu: NOAA Tech. Memo. NMFS, NOAA-TM-NMFS-SWFSC, 403–415. Smith, J. H., Mallett, A. K., Priston, R. A., Brantom, P. G., Worrell, N. R., Sexsmith, C., et al. (1996). Ninety-day feeding study in fischer-344 rats of highly refined petroleum-derived food-grade white oils and waxes. Toxicol. Pathol. 24, 214–230. Srivastava, S., Handoo, J., Agrawal, K., and Joshi, G. (1993). Phase-transition studies in n-alkanes and petroleum-related waxes: a review. J. Phys. Chemis. Solids 54, 639–670. Tornero, V., and Hanke, G. (2017). Potential Chemical Contaminants in the Marine Environment: An Overview of Main Contaminant Lists. JRC Technical reports, EUR 28925. Tornero, V. E. A. (2015). Review of the Commission Decision 2010/477/EU Concerning MSFD Criteria for Assessing Good Environmental Status. Descriptor 8. JRC technical reports, EUR 27464 EN. van Franeker, J. A. (2013). Survey of Methods and Data Analyses in the Netherlands OSPAR Beach Litter Monitoring Program. Imares unpublished report, June 2013.
van Franeker, J. A., and Meijboom, A. (2002). LITTER NSV, Marine Litter Monitoring by Northern Fulmars; A Pilot Study. Technical report, Green World Research, Alterra-rapport 401, Wageningen, Alterra. Warth, A. (1956). The Chemistry and Technology of Waxes, 2nd Edn. New York, NY: Reinhold Publishing Co.
Wells, P., Höfer, T., and Nauke, M. (1999). Evaluating the hazards of harmful substances carried by ships: the role of GESAMP and its EHS working group. Sci. Tot. Environ. 237, 329–350. Zhukov, A. (2017). The Distribution, Abundance and Characteristics of Plastic Debris Along the Coast of Grândola, Portugal. Ph.D. thesis, Yrkeshögskolan Novia. Copyright © 2018 Suaria, Aliani, Merlino and Abbate. This is an open-access article distributed under the terms of the Creative Commons Attribution License (CC BY). The use, distribution or reproduction in other forums is permitted, provided the original author(s) and the copyright owner are credited and that the original publication in this journal is cited, in accordance with accepted academic practice. No use, distribution or reproduction is permitted which does not comply with these terms.